To reach the doctor on call, call 317-879-8633 to receive recorded information on how to contact on-call personnel. The Avian and Exotic Animal Clinic provides 24-hour emergency care for seriously ill exotic pets. Sometimes it is difficult to know when your pet needs emergency care. If your emergency concerns wildlife, injured or orphaned wild animals that have been found outdoors, please click here. and some guidelines for what to do while waiting for a call from the veterinarian. The following images show how to set up a hospital cage at home, how to hand feed drops of sugar water, and other tips. To hand feed an anorexic rabbit, wrap the rabbit in a secure towel “burrito.” Stabilize the head with one hand and gently introduce the syringe or eyedropper into the side of the mouth with the other hand. Feed slowly. 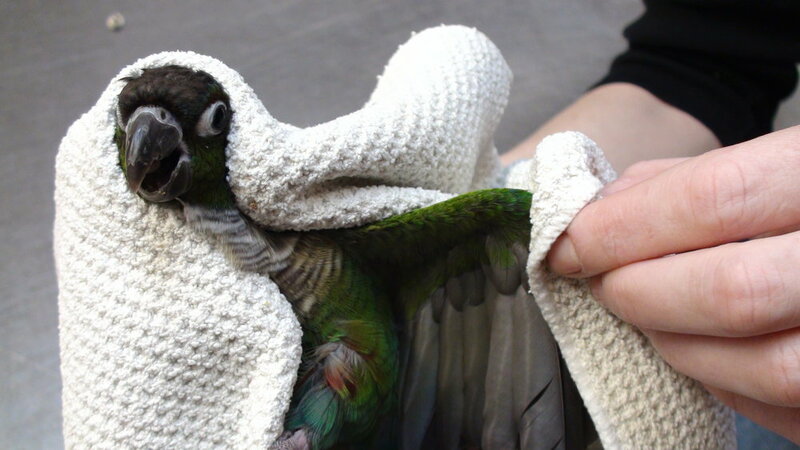 Birds can be safely restrained with a towel, holding them firmly around the neck. The neck and trachea of the bird are very strong; therefore it is difficult to injure or strangle a bird by holding around the neck. Take care not to restrict the bird’s body, as this can interfere with breathing. Use a solution of karo or pancake syrup in water to feed an ill bird that may not be eating well. If the bird shows signs of distress or begins breathing heavily, release him at once. Feed one drop a time for a total of 5-6 drops. Then offer regular food within easy reach while the bird rests in the hospital cage. Broken blood feathers may bleed when damaged. Hold the bird securely in the towel, and apply direct pressure to the bleeding area as shown. Pressure may need to be applied for as much as 4-5 minutes. Call for additional instructions. An ill bird in an aquarium, half on a heating pad set on low. The temperature should be kept at 80-85 degrees. Ferrets can simply be held or scruffed when being hand fed. They can be fed canned cat food or strained baby turkey or chicken.